Sinusitis is inflammation of the sinuses, which are air-filled cavities in the skull. The etiology can be infectious (bacterial, viral, or fungal) or noninfectious (allergic) triggers. This inflammation leads to blockade of the normal sinus drainage pathways (sinus ostia), which in turn leads to mucus retention, hypoxia, decreased mucociliary clearance, and predisposition to bacterial growth. Recurrent acute sinusitis, often defined as three or more episodes per year, with each episode lasting less than 2 weeks. The most common cause of acute sinusitis is an upper respiratory tract infection (URTI) of viral origin. The viral infection can lead to inflammation of the sinuses that usually resolves without treatment in less than 14 days. If symptoms worsen after 3 to 5 days or persist for longer than 10 days and are more severe than normally experienced with a viral infection, a secondary bacterial infection is diagnosed. The inflammation can predispose to the development of acute sinusitis by causing sinus ostial blockage. Although inflammation in any of the sinuses can lead to blockade of the sinus ostia, the most commonly involved sinuses in both acute and chronic sinusitis are the maxillary and the anterior ethmoid sinuses.7 The anterior ethmoid, frontal, and maxillary sinuses drain into the middle meatus, creating an anatomic area known as the ostiomeatal complex (Fig. 3). The nasal mucosa responds to the virus by producing mucus and recruiting mediators of inflammation, such as white blood cells, to the lining of the nose, which cause congestion and swelling of the nasal passages. The resultant sinus cavity hypoxia and mucus retention cause the cilia—which move mucus and debris from the nose—to function less efficiently, creating an environment for bacterial growth. © 2004 The Cleveland Clinic Foundation. When bacterial growth occurs in acute sinusitis, the most common organisms include Streptococcus pneumoniae, Haemophilus influenzae, and Moraxella catarrhalis.9 In chronic sinusitis, these organisms, plus Staphylococcus aureus, coagulase-negative Staphylococcus species, and anaerobic bacteria, are the most likely involved organisms. Organisms isolated from patients with chronic sinusitis increasingly are showing antibiotic resistance. In fact, penicillin resistance rates for S. pneumoniae are as high as 44% in parts of the United States.10 These resistant organisms commonly occur in patients who have received two or more recent courses of antibiotics. A distinct entity, allergic fungal sinusitis (AFS), occurs in immunocompetent patients and results from an immunologic reaction to fungi that colonize the sinuses.11 Most people tolerate exposure to mold spores in the air because they are ubiquitous in our environment. However, people with AFS develop a hypersensitivity reaction involving an intense eosinophilic inflammatory response to the fungus that has colonized the sinuses. Common fungi associated with this syndrome include Bipolaris specifera and Aspergillus, Curvularia, and Fusarium species.11 This is an allergic noninvasive response to the fungus that should be distinguished from invasive fungal sinusitis, which is more common in diabetic and immunocompromised patients. 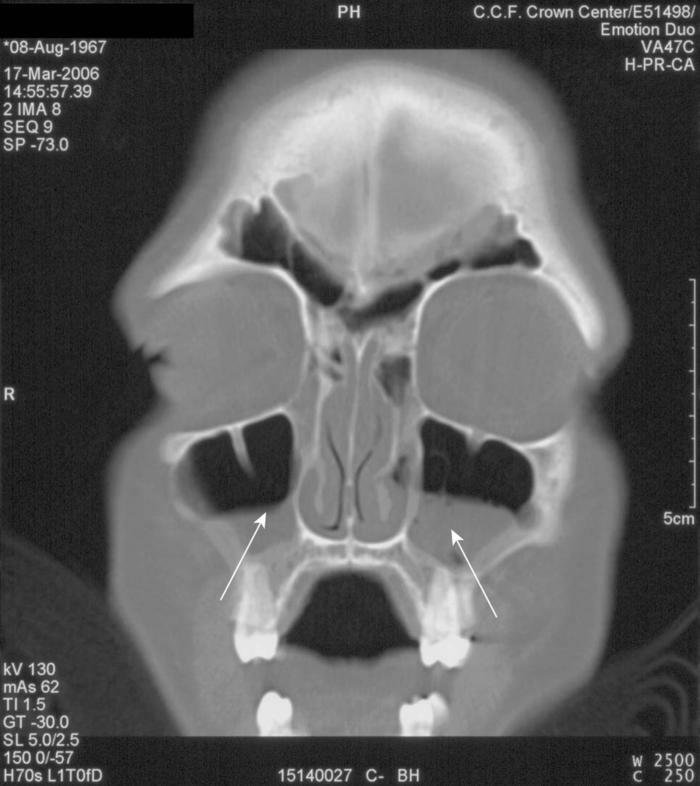 The diagnostic criteria for AFS include findings of chronic sinusitis on computed tomography (CT) of the sinuses (such as mucosal thickening, opacification, polyps, and high-intensity signaling from the high protein content in the mucus) or low signaling of fungal concretions in sinus cavities on MRI. On sinus culture, fungi can be isolated with associated allergic mucin, which is mucus loaded with degranulated eosinophils. Allergy skin testing can verify that these patients have an immunoglobulin E (IgE)-mediated reaction to molds. Acute bacterial sinusitis in adults most often manifests with more than 7 days of nasal congestion, purulent rhinorrhea, postnasal drip, and facial pain and pressure, alone or with associated referred pain to the ears and teeth. There may be a cough, often worsening at night.12 Children with acute sinusitis might not be able to relay a history of postnasal drainage or headaches, so cough and rhinorrhea are the most commonly reported symptoms.13 Other symptoms can include fever, nausea, fatigue, impairments of smell and taste, and halitosis. Chronic sinusitis can cause more indolent symptoms that persist for months. Nasal congestion and postnasal drainage are the most common symptoms of chronic sinusitis. Chronic cough that is described as worse at night or on awakening in the morning is also a commonly described symptom of chronic sinusitis. Clinical evidence of chronic sinusitis may be subtle and less overt than in acute sinusitis unless the patient is having an acute sinusitis exacerbation. Because this diagnosis may be more difficult to make in the primary care setting or in a setting without radiographic or rhinoscopic capabilities, Lanza and Kennedy have proposed14 a major and minor classification system to define chronic sinusitis by the manifesting symptoms (Box 2). 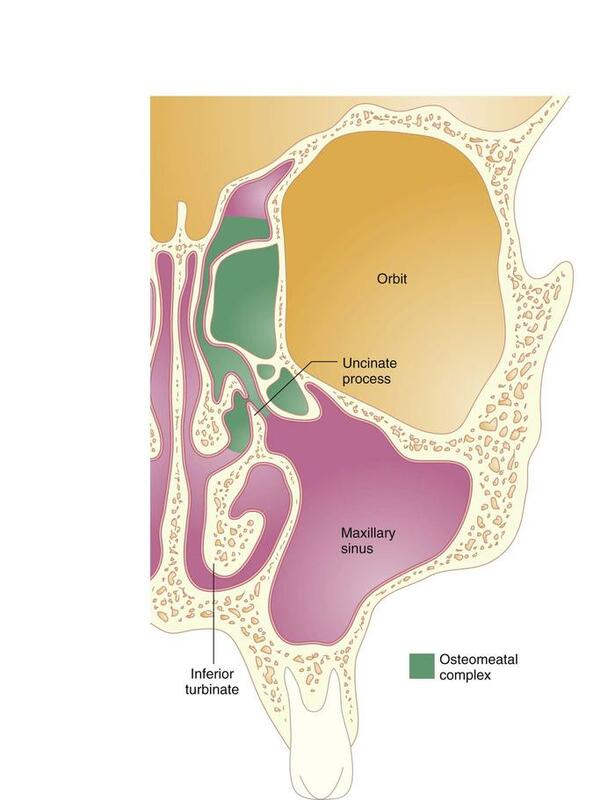 Reprinted from Otolaryngology-Head and Neck Surgery, Vol 117, Donald C. Lanza, MD and David K. Kennedy, MD, Adult rhinosinusitis defined, pp S1-S7. Copyright 1997, with permission from the American Academy of Otolaryngology—Head and Neck Surgery Foundation, Inc. Typical physical signs include bilateral nasal mucosal edema, purulent nasal secretions, and sinus tenderness (however, this is not a sensitive or specific finding). The location of sinus pain depends on which sinus is affected. Pain on palpation of the forehead over the frontal sinuses can indicate that the frontal sinuses are inflamed; however, this is also a very common area for tension headaches. Infection in the maxillary sinuses can cause upper jaw pain and tooth sensitivity, with the malar areas tender to the touch. Because the ethmoid sinuses are between the eyes and near the tear ducts, ethmoid sinusitis may be associated with swelling, tenderness, and pain in the eyelids and tissues around the eyes. The sphenoid sinuses are more deeply recessed, and sinusitis there can manifest with vague symptoms of earaches, neck pain, and deep aching at the top of the head. However, in most patients with a suspected diagnosis of sinusitis, pain or tenderness is found in several locations, and the perceived area of pain usually does not clearly delineate which sinuses are inflamed. Purulent drainage may be evident on examination as anterior rhinorrhea or visualized as posterior pharyngeal drainage with associated clinical symptoms of sore throat and cough. The nose should be examined for a deviated nasal septum, nasal polyps, and epistaxis. Foreign bodies and tumors can mimic symptoms of sinusitis and should be in the differential diagnosis, especially if the symptoms are unilateral. The ears should be examined for signs of associated otitis media and the chest for the presence of asthma exacerbation, a common comorbid condition. In a primary care setting, a good history and physical examination to detect the presence of most or all of the commonly manifesting signs and symptoms can provide a reliable diagnosis of acute sinusitis. The presence of purulent secretions has the highest positive predictive value for diagnosing sinusitis clinically. Differentiating it from a common viral URTI is most important. Mucus in URTIs is typically not described as persistently purulent. Nasal congestion is a predominant symptom without persistent or worsening head congestion, headache, or facial pain or fatigue. URTI symptoms would be expected to peak on about day 3 to 5 and resolve within 7 to 10 days. Most other diagnostic modalities, described later, aid in the differential diagnosis of persistent nasal symptoms. The two modalities most commonly used include the plain radiograph and CT scan. Plain radiography does not adequately represent the individual ethmoid air cells, the extent of mucosal thickening in chronic sinusitis, or visualization of the ostiomeatal complex. Magnetic resonance imaging can be considered for evaluation of suspected tumors but is not recommended for acute sinusitis because it does not distinguish air from bone. For these reasons, CT scanning of the sinuses is the imaging procedure of choice (Fig. 4). 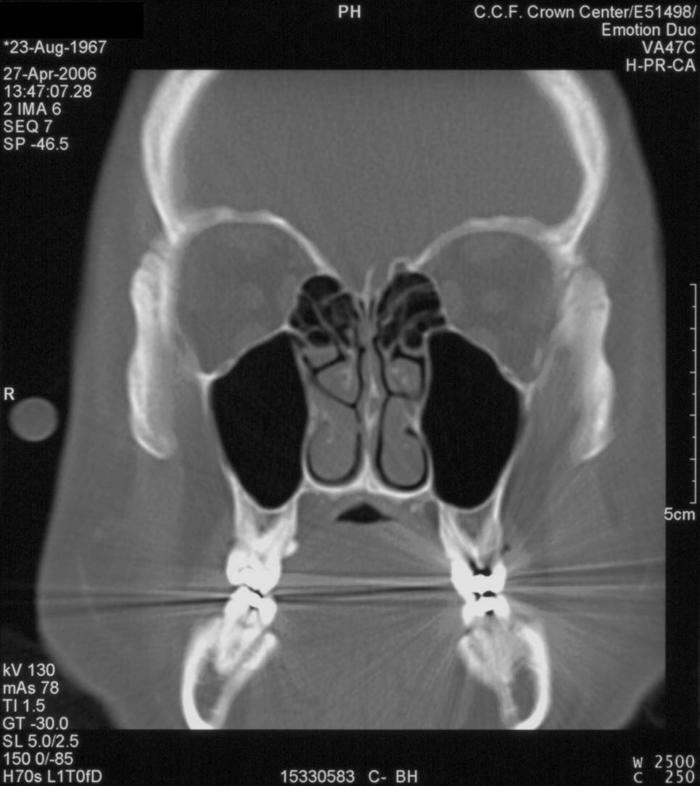 In many centers, the cost is similar to that of plain radiographs because of the availability of limited coronal views (usually comprising approximately six coronal views of the maxillary, ethmoid, sphenoid, and frontal sinuses) that are optimally sufficient for ruling out sinusitis. More detailed coronal slices are useful for viewing the ostiomeatal complex and for surgical mapping. A common practice before plain radiographs and CT scans were widely available, transillumination is of limited use and ahs a high rate of error. Ultrasonography has not been proved accurate enough to substitute for a radiographic evaluation. However, it may be considered to confirm sinusitis in pregnant women, for whom radiographic studies could pose a risk. By examining the cellular contents of the nasal secretions, one might find polymorphonuclear cells and bacteria in sinusitis. In a viral infection, these would not be found, and in allergic disease, one would expect to find eosinophils. The most accurate way to determine the causative organism in sinusitis is a sinus puncture. After anesthetization of the puncture site, usually in the canine fossa or inferior meatus, the contents of the maxillary sinus are aspirated under sterile technique, and bacterial cultures are performed to identify the organism. Culture specimens obtained from nasal swabs correlate poorly with sinus pathogens found by puncture because of contamination of the swab with normal nasal flora. However, because sinus puncture is an invasive procedure, it is not routinely performed. More recently, studies have shown a close correlation between organisms found by sinus puncture and by endoscopically guided aspiration of the sinus cavities through the middle meatus. Although this needs to be done by an otolaryngologist trained in the procedure, it may be necessary for defining the pathogenic organism when standard therapy has failed or in an immunocompromised patient who is at high risk for sequelae of untreated sinusitis, such as orbital or central nervous system complications. Differentiating bacterial sinusitis from a common viral URTI is most important. The presence of purulent secretions has the highest positive predictive value for clinically diagnosing sinusitis. CT of the sinuses is the imaging procedure of choice. Antibiotics, such as amoxicillin for 2 weeks, have been the recommended first-line treatment of uncomplicated acute sinusitis. The antibiotic of choice must cover S. pneumoniae, H. influenzae, and M. catarrhalis. Because rare intracranial and orbital complications of acute bacterial sinusitis are caused by S. pneumoniae (most commonly in the immunocompromised host), adequate coverage for this organism is important. Amoxicillin-clavulanate (Augmentin) is also an appropriate first-line treatment of uncomplicated acute sinusitis. The addition of clavulanate, a beta-lactamase inhibitor, provides better coverage for H. influenzae and M. catarrhalis.15 Because of S. pneumoniae resistance, higher doses of amoxicillin (90 mg/kg/day to a maximum of 2 g/day) should be considered. These higher doses are effective against S. pneumoniae because resistance is related to alteration in penicillin-binding proteins, a mechanism distinct from the beta-lactamase enzymatic inactivation of H. influenzae and M. catarrhalis. Other options include cephalosporins such as cefpodoxime proxetil (Vantin) and cefuroxime (Ceftin). In patients allergic to beta-lactams, trimethoprim-sulfamethoxazole (Bactrim), clarithromycin (Biaxin), and azithromycin (Zithromax) may be prescribed but might not be adequate coverage for H. influenzae or resistant S. pneumoniae.16 Penicillin, erythromycin (Suprax), and first-generation cephalosporins such as cephalexin (Keflex, Keftab) are not recommended for treating acute sinusitis because of inadequate antimicrobial coverage of the major organisms. If treatment with one of these first-line agents has not shown a clinical response within 72 hours of initial therapy, more broad-spectrum antibiotics should be considered. These include the fluoroquinolones, gatifloxacin (Tequin), moxifloxacin (Avelox), and levofloxacin (Levaquin), especially if amoxicillin-clavulanate, cefpodoxime proxetil, and cefuroxime were previously prescribed. Antibiotic therapy for chronic sinusitis is controversial and may be most appropriate for acute exacerbation of chronic sinusitis. Medical therapy should include both a broad-spectrum antibiotic and a topical intranasal steroid to address the strong inflammatory component of this disease. Antibiotic therapy might need to be continued for 4 to 6 weeks.12 The antibiotics of choice include agents that cover organisms causing acute sinusitis but also cover Staphylococcus species and anaerobes. These include amoxicillin-clavulanate, cefpodoxime proxetil, cefuroxime, gatifloxacin, moxifloxacin, and levofloxacin. Currently used topical intranasal steroids such as fluticasone (Flonase), mometasone (Nasonex), budesonide (Rhinocort AQ), and triamcinolone (Nasacort AQ) have a favorable safety profile and indications for the pediatric age group. A short course of oral steroids may be used for extensive mucosal thickening and congestion or nasal polyps. To temporarily alleviate the drainage and congestion associated with sinusitis, decongestant nasal sprays oxymetazoline (Afrin) and phenylephrine hydrochloride (Neo-Synephrine) may be used for 3 to 5 days. Long-term use of topical decongestants can cause rhinitis medicamentosa, which is rebound congestion caused by vasodilatation and inflammation. Oral decongestants (pseudoephedrine) may be a reasonable alternative if the patient has no contraindication such as hypertension. Mucolytic agents (guaifenesin) can help to decrease the viscosity of the mucus for better clearance and are often found in combination with decongestants. Some mucolytics are now available over the counter. Saline spray or irrigation can help clear secretions. Topical corticosteroids are not indicated for acute sinusitis but may be helpful for chronic sinusitis, nasal polyps, and allergic and nonallergic rhinitis. Antihistamines are not indicated for sinusitis but may be helpful for underlying allergic rhinitis. Laboratory evaluation may be necessary to look for an underlying disorder that can predispose to sinusitis. The evaluation may include a sweat chloride test for cystic fibrosis, ciliary function tests for immotile cilia syndrome, blood tests for HIV, or other tests for immunodeficiency, such as immunoglobulin levels. Any patient with recurrent acute or chronic sinusitis should have an allergy consultation to rule out allergy to dust mites, mold, animal dander, and pollen, which can trigger allergic rhinitis. An allergy consultation will provide immediate hypersensitivity skin testing to delineate which environmental aeroallergens exacerbate allergic rhinitis and predispose to sinusitis. Medical management and environmental control measures are discussed. Treatment options such as medications, immunotherapy, or both (allergy shots) are considered. Additional evaluation for comorbid conditions such as asthma, sinusitis, and gastroesophageal reflux are addressed and treated. Allergists are also trained in aspirin desensitization for treatment of patients with the aspirin triad. 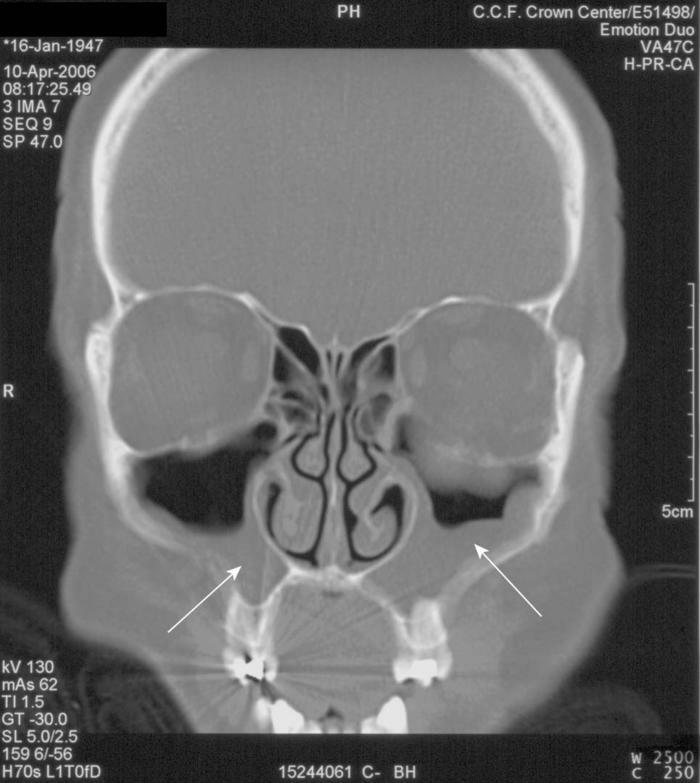 Orbital extension of sinus disease is the most common complication of acute sinusitis. This complication is more common in children. Immediate management includes broad-spectrum intravenous antibiotics, a CT scan to determine the extent of disease, and possibly surgical drainage of the infection if there is no response to antibiotics. Extension to the central nervous system can also occur. The most common intracranial complications are meningitis (usually from the sphenoid sinus, which is anatomically located closest to the brain) and epidural abscess (usually from the frontal sinuses). Because of the extent of sinus blockage and the strong association with polyps, surgery is usually indicated to remove the inspissated allergic mucin and polyps, followed by systemic corticosteroids to decrease the inflammatory response.7 Treatment guidelines are based on the use of systemic steroids in allergic bronchopulmonary aspergillosis, in which steroids are tapered to daily or every-other-day dosing to control the disease. Commonly, nasal steroids are also added for topical treatment. Studies are currently being conducted to establish the role of antifungal agents or inhalant allergen immunotherapy for the treatment of AFS. The antibiotic of choice for acute sinusitis must cover S. pneumoniae, H. influenzae, and M. catarrhalis. The antibiotics of choice for chronic sinusitis include agents that cover organisms causing acute sinusitis but that also cover Staphylococcus species and anaerobes. Medical therapy for chronic sinusitis should include a topical intranasal steroid to address the strong inflammatory component of this disease. Allergy consultation should be considered in any patient with recurrent acute or chronic sinusitis to rule out allergy as a contributing factor for sinusitis. If medical therapy fails or if complications are suspected, an otolaryngology consultation is warranted. URTIs of viral origin should run their course, with gradual improvement in symptoms daily until complete resolution of symptoms occurs by day 7 to 10, with supportive treatment only and no antibiotics. Overall, we have many treatment options for the sinusitis patient: antibiotics for the bacterial infection; steroids, systemic or topical, for the inflammatory component; and surgery for the anatomic and structural abnormalities that can predispose to sinusitis. Although these have helped with initial improvement, we still see a high rate of recurrence of sinus disease. This forces us to address the role of comorbid conditions such as allergic rhinitis, environmental irritants (e.g., cigarette smoke), or the need for newer and better treatment modalities for this disease. Slavin RG. The diagnosis and management of sinusitis: A practice parameter update. J Allergy Clin Immunol. 2005, 116: (6 Suppl): 13-47. Agency for Health Care Policy and Research: Evidence Report/Technology Assessment no. 9. Diagnosis and Treatment of Acute Bacterial Rhinosinusitis. Rockville, Md: U.S. Dept of Health and Human Services, Agency for Health Care Policy and Research. AHCPR Publication no. 99-EO16. Spiegel JH. Sinusitis [entire issue]. Otolaryngol Clin North Am. 2004, 37: (2): 221-506. Centers for Disease Control and Prevention: Vital and health statistics: Current estimates from the National Health Interview Survey, 1995. U.S. Dept of Health and Human Services, Centers for Disease Control and Prevention/National Center for Health Statistics. Ivker R. Respiratory disease: Sinusitis, upper respiratory infection, otitis media. Clin Fam Pract. 2002, 4: 929. Ray NF, Baraniuk JN, Thamer M, et al: Healthcare expenditures for sinusitis in 1996: Contributions of asthma, rhinitis, and other airway disorders. J Allergy Clin Immunol. 1999, 103: 408-414. Hamilos DL. Chronic sinusitis. J Allergy Clin Immunol. 2000, 106: 213-227. Winstead W. Rhinosinusitis. Prim Care. 2003, 30: 137-154. Dykewicz MS. The microbiology and management of acute and chronic rhino-sinusitis. Curr Infect Dis Rep. 2001, 3: 209-216. Doern GV, Pfaller MA, Kugler K, et al: Prevalence of antimicrobial resistance among respiratory tract isolates of Streptococcus pneumoniae in North America: 1997 Results from the SENTRY antimicrobial surveillance program. Clin Infect Dis. 1998, 27: 764-770.
deShazo RD, Swain RE. Diagnostic criteria for allergic fungal sinusitis. J Allergy Clin Immunol. 1995, 96: 24-35. Spector SL, Bernstein IL, Li JT, et al: Parameters for the diagnosis and management of sinusitis. J Allergy Clin Immunol. 1998, 102: S107-S144. American Academy of Pediatrics, Subcommittee on Management of Sinusitis and Committee on Quality Improvement. Clinical practice guideline: Management of sinusitis. Pediatrics. 2001, 108: 798-808. Lanza DC, Kennedy DW. Adult rhinosinusitis defined. Otolaryngol Head Neck Surg. 1997, 117: (3 pt 2): S1-S7. Sinus and Allergy Health Partnership. Antimicrobial treatment guidelines for acute bacterial rhinosinusitis. Executive summary. Otolaryngol Head Neck Surg. 2000, 123: (1 Pt 2): 5-31. Wald ER. Microbiology of acute and chronic sinusitis in children and adults. Am J Med Sci. 1998, 316: 13-20. Hoban DJ, Doern GV, Fluit AC, et al: Worldwide prevalence of antimicrobial resistance in Streptococcus pneumoniae, Haemophilus influenzae, and Moraxella catarrhalis in the SENTRY Antimicrobial Surveillance Program 1997-1999. Clin Infect Dis. 2001, 32: (suppl 2): S81-S93. Szczeklik A, Stevenson DD. Aspirin-induced asthma: Advances in pathogenesis and management. J Allergy Clin Immunol. 1999, 104: 5-13.